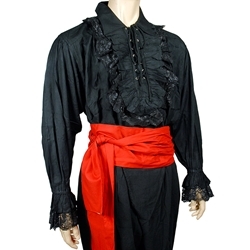 Our Pirate Captain's Ruffled Shirt in Plus Size is made from soft rich Rayon which is light weight and cool. The lacy frills on the chest and cuffs give it the perfect Pirate look. Will also work well as Renaissance era garb. Eyelets with drawstring closure at neck and elastic wrists make for easy wearing. Practical and comfortable for all day wear. Cold wash, line dry.